Adam Robbins was born on October 4, 1978, in Texarkana, Texas. He entered the U.S. Military Academy at West Point, New York, on June 30, 1997, and was commissioned a 2d Lt of Armor in the U.S. Army on June 2, 2001. 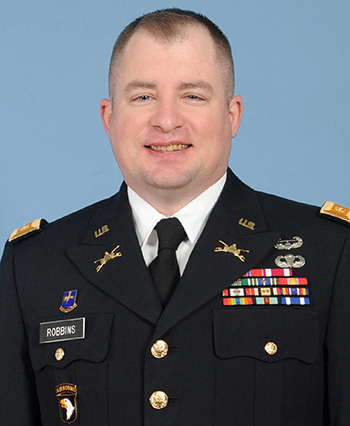 After completing the Armor Basic Officer Leaders Course at Fort Knox, Kentucky, Lt Robbins served as a Scout Platoon Leader, Mortar Platoon Leader, and then Company Executive Officer with 1st Battalion, 509th Infantry Regiment (Airborne) at Fort Polk, Louisiana, from December 2001 to August 2005. During this time he completed the Basic Airborne Course at Fort Benning, Georgia, in 2002. Captain Robbins next served as a Plans Officer with the 2nd Brigade Combat Team of the 101st Airborne Division at Fort Campbell, Kentucky, from August 2005 to December 2006, followed by service as a Troop Commander and then Assistant S3 (Operations and Training Officer) with 1st Squadron, 75th Cavalry Regiment at Fort Campbell from December 2006 to April 2009. During this time he attended Air Assault School at Fort Campbell in 2007. He served as a Company Commander with the Kansas City Recruiting Battalion, U.S. Army Recruiting Command, in Kansas City, Missouri, from April 2009 to November 2010, and then as a Battle Staff Observer Controller/Trainer (OC/T), Live Fire OC/T, and as a Plans Officer with the National Training Center in Fort Irwin, California, from November 2010 to March 2013. Major Robbins next served as a Plans Officer with the 3rd Brigade Combat Team of the 1st Infantry Division at Fort Knox from March to October 2013, and then as Battalion Executive Officer with 3-1 Special Troops Battalion, 3rd Infantry Brigade Combat Team, 1st Infantry Division at Fort Knox from October to December 2013. He served as Battalion S3 with Headquarters and Headquarters Company with Headquarters Brigade at Fort Knox from December 2013 to June 2014, and then as Executive OC/T with 1st Battalion, 409th Regiment of the 4th Cavalry Brigade at Fort Knox from June 2014 until he left active duty on May 1, 2015. Major Robbins joined the Army Reserve in New Orleans, Louisiana, on March 23, 2016, and is currently serving as Battalion Operations Officer with the 1192nd Deployment and Distribution Support Battalion. During his time on active duty, he deployed to Iraq from November 2005 to September 2006, and from October 2007 to October 2008. He also deployed to Afghanistan from February to November 2010, and from May to November 2013. For exceptionally meritorious service while assigned as a Troop Commander during Operation IRAQI FREEDOM. 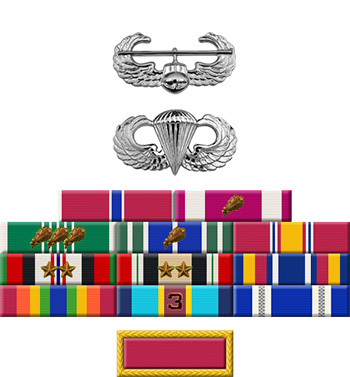 Captain Robbins' outstanding performance, expertise, and contributions were instrumental to the unit's overall success during combat operations. His actions reflect distinct credit on him, the Multinational DIVISION-BAGHDAD, and the United States Army.